The Ecopôle Seine Aval was designed to be a welcoming district for businesses and residents alike, set in the landscape formed by the two banks of the Seine, looking out over the town, the Seine valley and its extensive nature areas, and the agricultural plain. The planning guide revolves around two large green malls (shady promenades nearly 20m wide) linked to the RD190, with extensive views over the Seine hillsides and the eco-port. not only a pleasant walk between the Seine and the Coeur vert project but also fully-fledged ecological corridors. 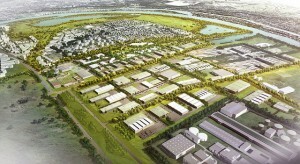 They map out the future district, which will contain an urban sector including homes and facilities to the south, a sector set aside for businesses that require direct access to the port and, further north, an area earmarked for eco-industries, following on from the SIAAP wastewater management authority already in place. Lastly, an Espace d’Intérêt Ecologique (area of ecological interest) will be created in the northern part of the Ecopôle Seine Aval, covering an area of 24 hectares near the Etang Cousin pond. Made up of a wetland, a dry prairie and wooded areas, it will extend the ecological network and provide a home for the region’s many breeding avifauna. Following on from the Parc du Peuple de l’herbe, the area of ecological interest will form another link in the Chanteloup loop’s ecological and landscape network. In terms of town planning and landscape composition, the challenge here is to build a sustainable green business district that is not a monofunctional enclave – as business parks often are – but a place in direct interaction with the broader landscape (and its environmental characteristics) and the urban fabric that surround it. In short, a place where people do business, live and take strolls, and which also anticipates the site’s adaptability for future generations.